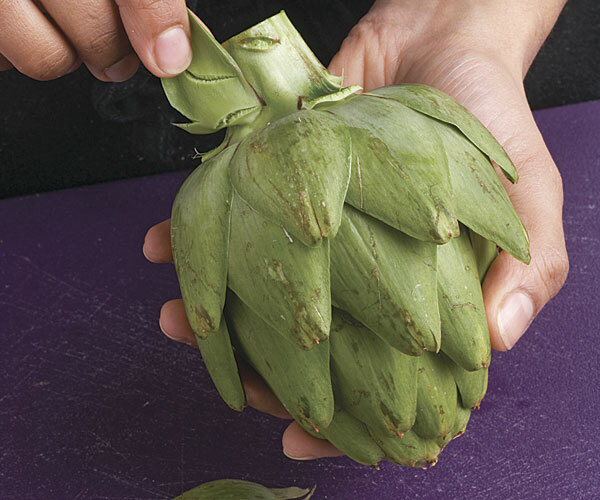 Artichokes are surprisingly versatile, so don’t let their prickly and thorny outsides keep you from eating them steamed, stuffed, braised (or even raw). 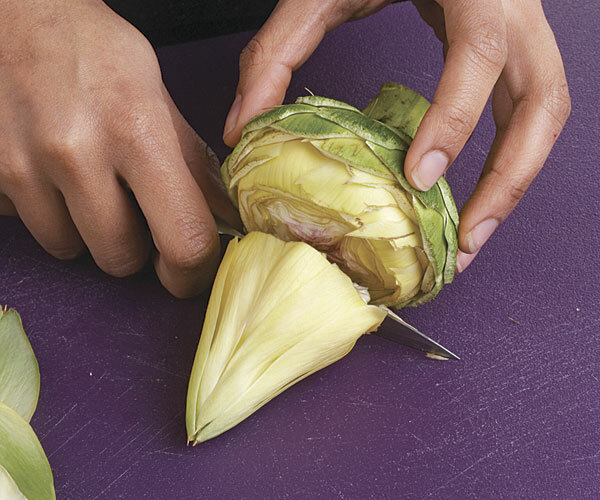 Here, we’ll show you four ways to clean and trim artichokes for recipes. 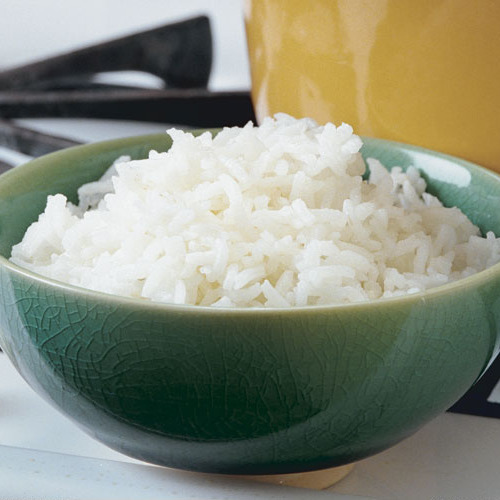 For all methods, have ready a bowl of water and two halved lemons. 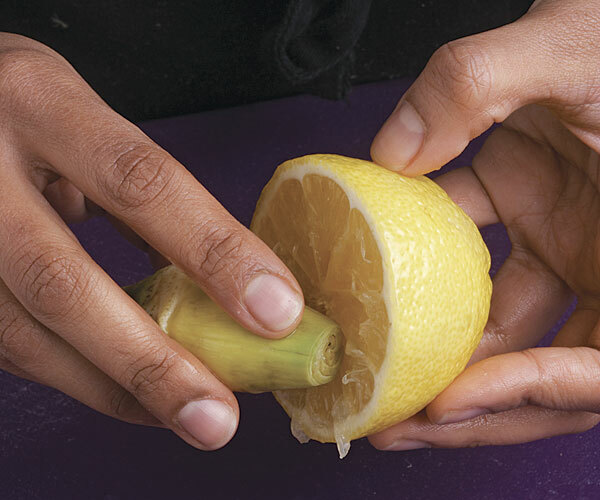 Squeeze three of the halves into the water (see Acidulated Water, below) and reserve one half. 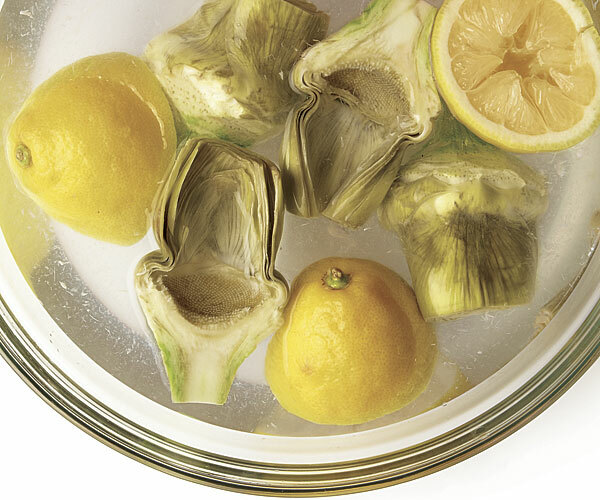 As you work, rub the reserved lemon half over the cut surfaces and immediately put the trimmed artichokes in the lemon water to slow the oxidation. 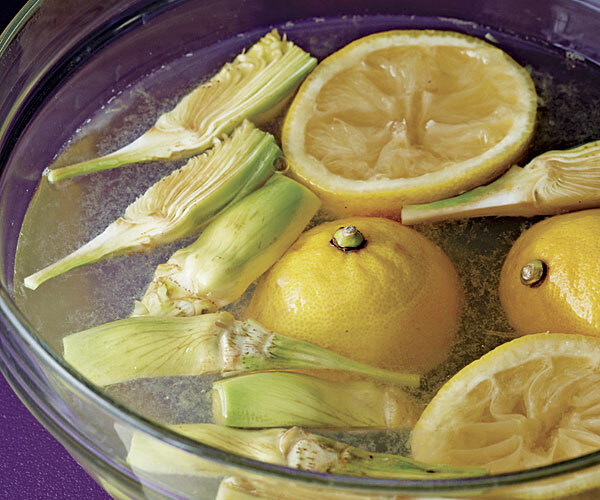 Wet a clean dishtowel in the lemon water and put it over the artichokes to keep them submerged. 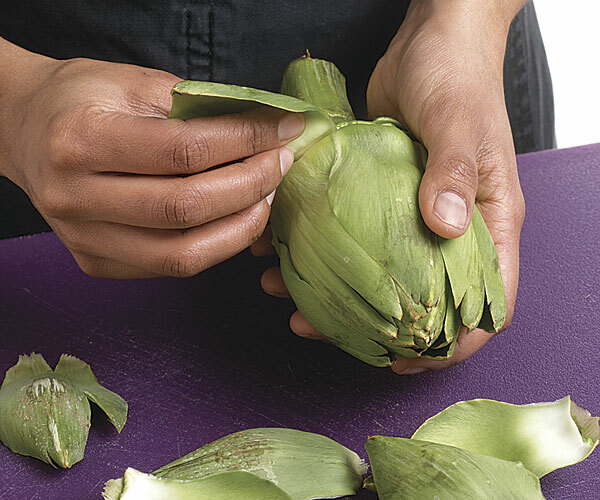 Step one: Snap off the dark-green outer leaves of the artichoke until only the pale, tender inner leaves remain. 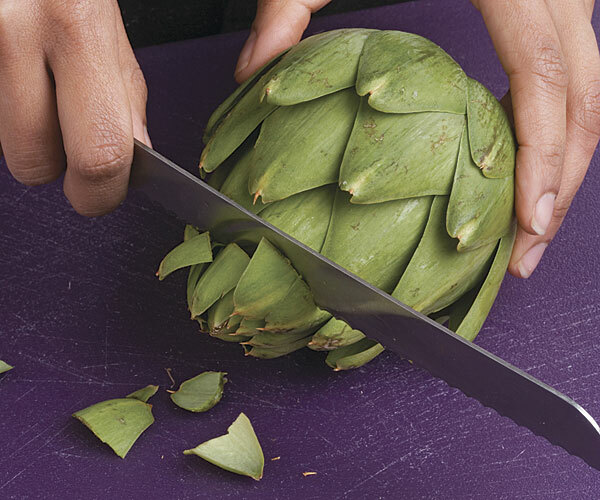 Step two: Cut off the top 1/4 inch of the artichoke. 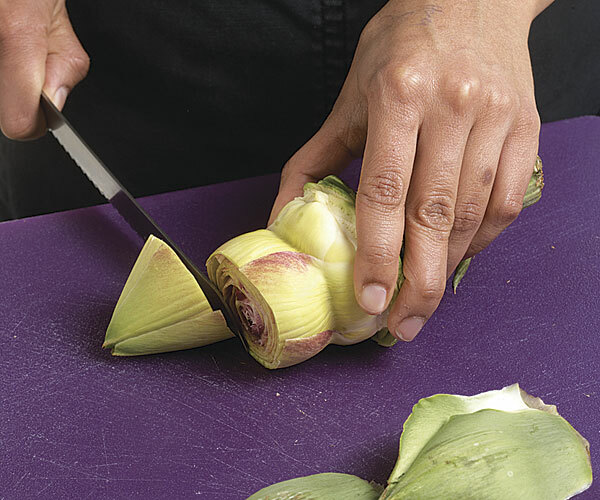 Step three: Trim the stem end and any dark parts around the bottom. 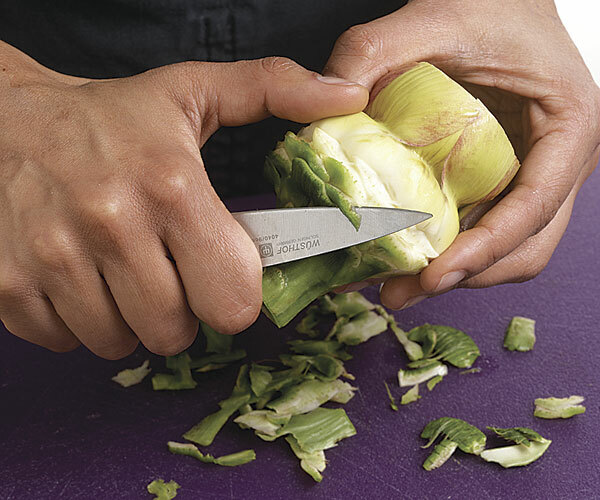 Step four: Cut, if needed, and drop into acidulated water. 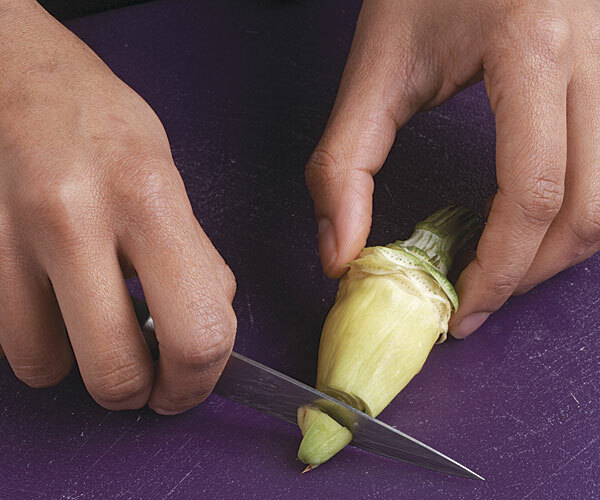 Step one: Cut off the bottom of the stem, leaving about 1/2 inch. 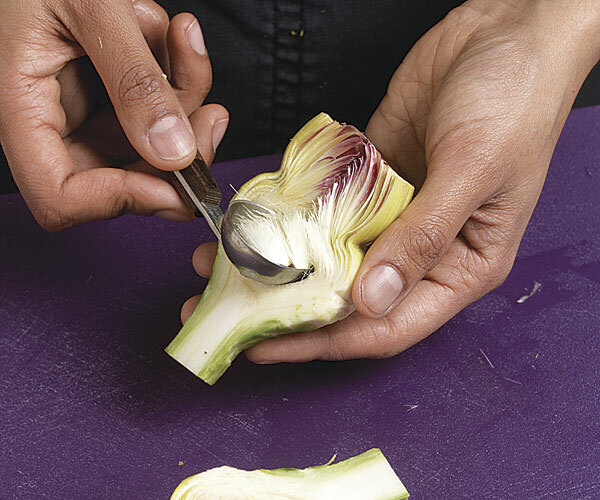 Step two: Pull off any small fibrous dark leaves around the base. 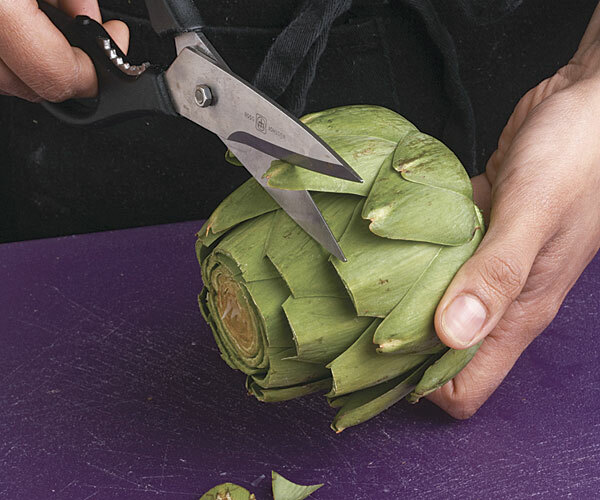 Step three: Cut off the top 1/2 inch of the artichoke. 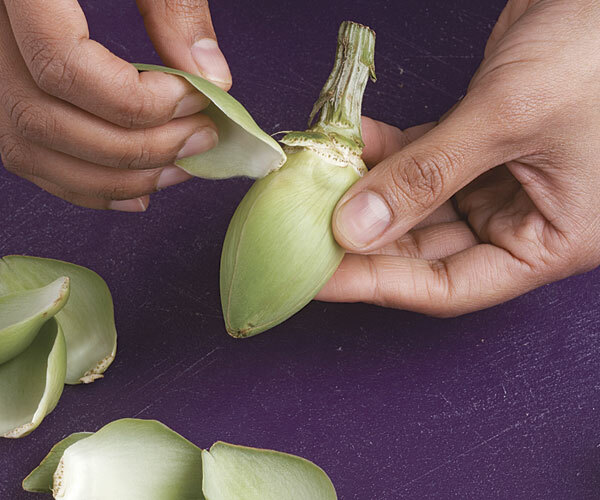 Step four: Using scissors, trim off the sharp, pointed tips of the remaining leaves. 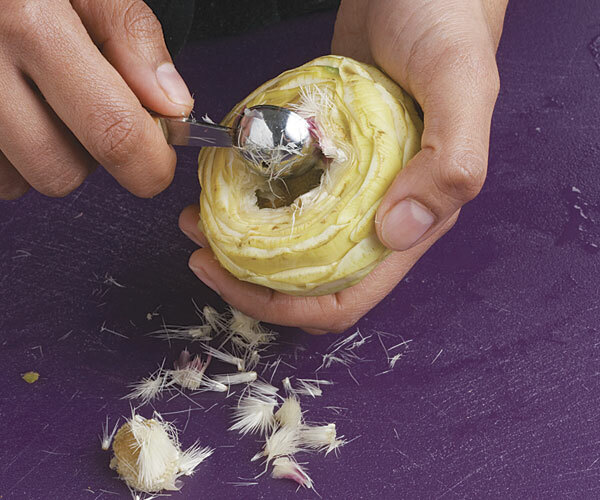 Step two: Cut off the top third of the artichoke and all but 1 inch of the stem. 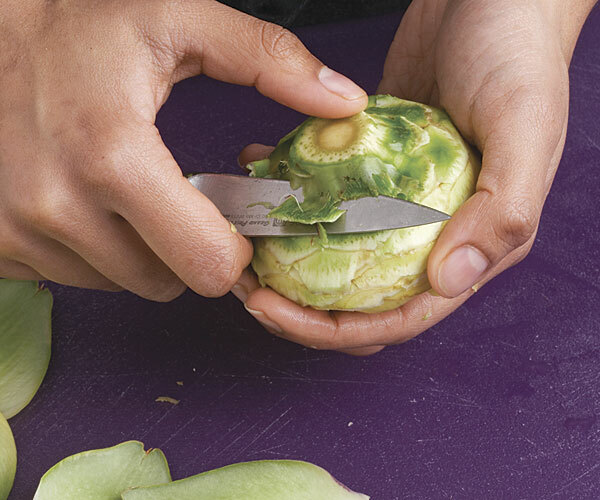 Step three: Using a paring knife, peel away the tough outer layer of the stem and remove the base of the leaves all around. 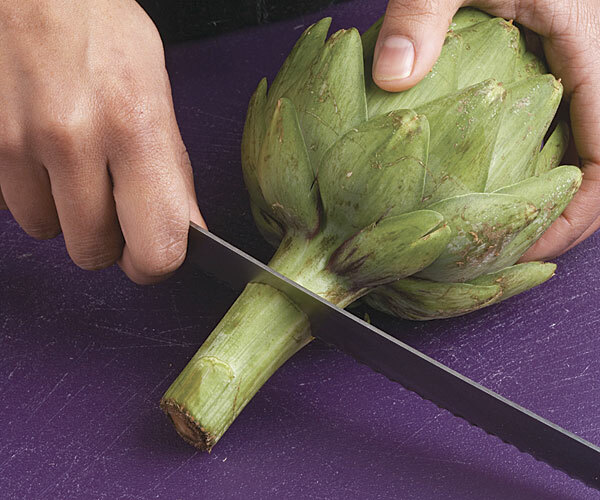 Step four: Cut the artichoke in half lengthwise. 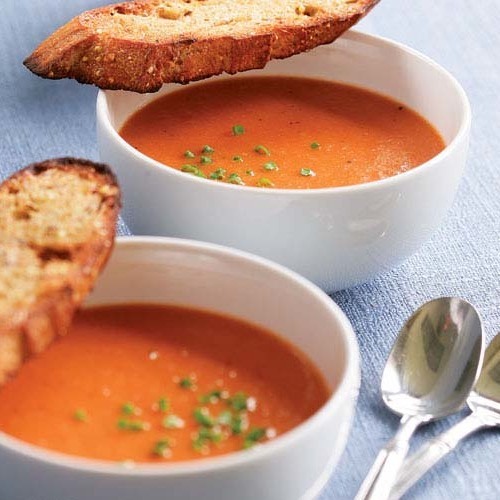 With a spoon or melon baller, scoop out and discard the hairy choke and thorny inner leaves. Step two: Cut off the leaves at the base. 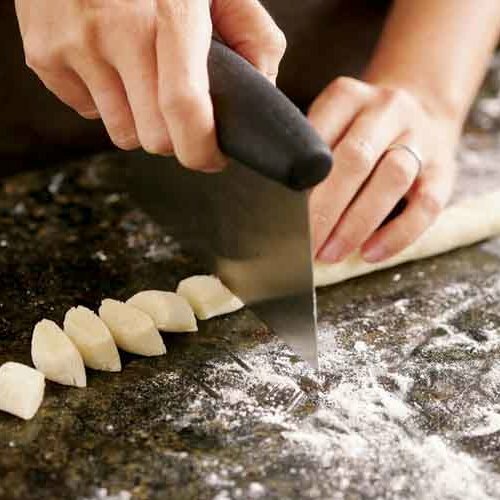 Step three: Using a paring knife, cut off the stem (you’ll need a flat bottom) and remove the base of the leaves all around. 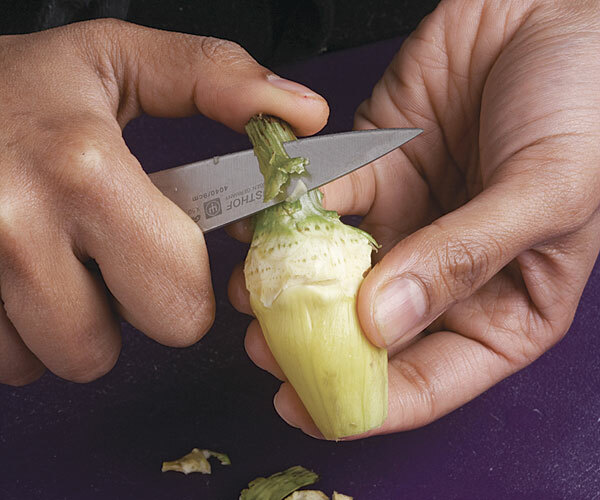 Step four: With a spoon or melon baller, scoop out and discard the hairy choke and thorny inner leaves. 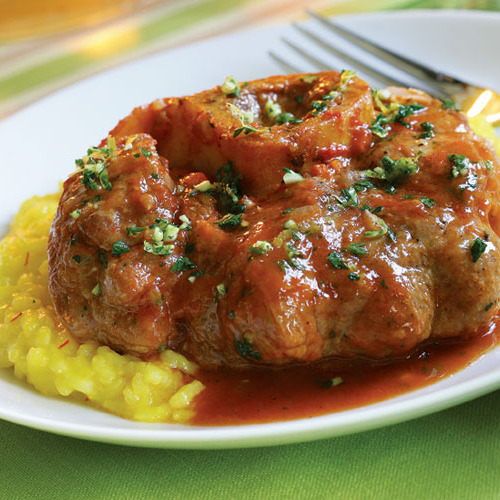 Acidulated water is a culinary term that refers to a mixture of water and an acid, such as vinegar, lemon, or lime juice. 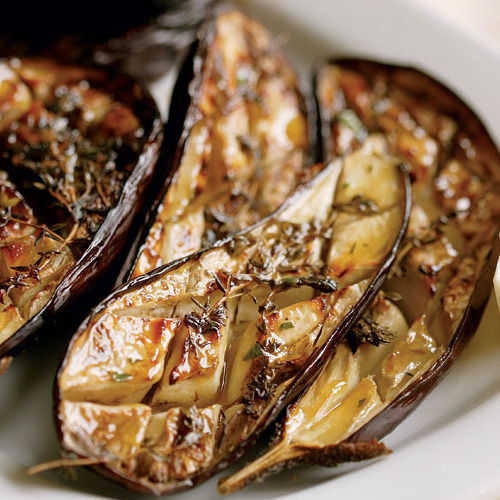 It’s used to prevent certain fruits and vegetables from browning, or oxidizing, when cut and exposed to air. 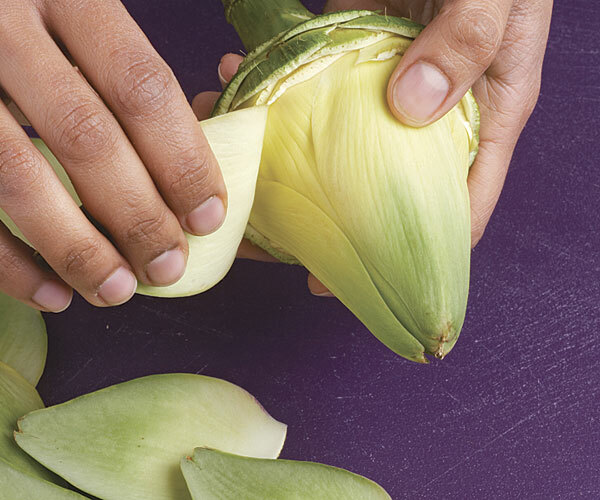 Artichokes are especially prone to oxidation, and that’s why we recommend immediately rubbing their cut surfaces with extra lemon juice before submerging them in acidulated water.